Roasted pine kernels are a common garnish in Italian cookery, and a key ingredient of the superb pesto sauce. This recipe uses ground pine kernels to thicken and flavour a pasta sauce. The superb, delicate flavour of this sauce is the perfect compliment to cooked, fresh, filled pasta and totally belies the simplicity of its ingredients. Due to its richness, this sauce is used quite sparingly. Half a small onion, finely chopped. 2 cloves garlic, finely mashed. 2 tbsp ground, toasted pine kernels. 1 small carton of single cream. 1 pack of fresh ricotta and spinach or pumpkin ravioli or tortellini. Saucepan full of boiling, salted water. Whole, toasted pine kernels and chopped fresh parsley. Heat the oil in a small saucepan and add the onion and garlic. Stir and fry gently to soften the onions. Add the ground, toasted pine kernels and stir. Add the cream and stir continuously until the cream begins to boil. Adjust for taste with a little lemon juice. Turn off the heat to the sauce and start the pasta. Add the filled pasta to the boiling water and stir once. Boil for 3 minutes, drain and arrange the pasta on serving dishes. Drizzle the sauce sparingly over the cooked pasta. 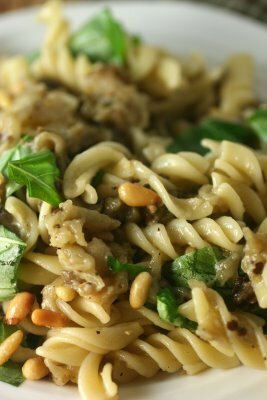 Garnish with whole, toasted pine kernels and chopped parsley. Add a little sea salt and freshly ground black pepper. Any vegetable-filled pasta will do here, but avoid harsh or sour flavours and meat-filled varieties. The sauce is also excellent simply tossed with unfilled pasta like lingune, spaghetti, tagliatelle and paparadelle (ribbon pasta). Try to avoid the cliché of adding parmesan to this dish; it will overpower the delicacy of the sauce.